I was wandering around on the web this evening reading a variety of things related to the Communal Italian army of Sienna that I'm starting to paint, and I found some material that cast into doubt a line in the Later Communal Italian army list. As it is right now there is an entry for 0-2 Warwagons, with the text entry "Plaustrella man-pushed spiked wagons". Searching on the web, it seems the Plaustrella concept is based upon a single battle of 1169 where some dude from Milan (who is actually named in the primary source, but I forget the name right now) is credited with building them, there were up to 100 of them, and they were used against Frederick Barbarossa (the Holy Roman Emperor). First off, shielded wagons and carts with fixed-mounted spikes and blades is not war wagons. Man-pushed tools like that could engage (come into contact with) enemy troops; WWg cannot. Man-pushed tools like that have no missile fire; WWg do. Second, if this happened exactly once in a specific battle with a specific inventor, and were never used again, then we should likely limit their use to Milan in 1169. May be purchased for 0-2 stands of Heavy Foot. Changes the basing to 2 MU square to distinguish the stands from other Heavy Foot. Cost: something like 2 pts each? Possibly 1 pt each, although in a world where Knights are the dominant arm (i.e., in their historical environment) 2 pts seems better. Maybe 1.5 points each (round up)? Is anyone aware of any other historical use of plaustrella by the Communal Italians? To be specific, is it appropriate for armies other than Milan in 1169 to use them. Does anyone know of any other similar artifacts used by other cultures? IIRC, there is some reference to a device like this in an Indian army at some point? Rathamasaula man-pushed spiked carts in the Classical Indian army; 0-1 stand probably if we use the same Battle Card system. Romans apparently had something similar for fighting against Elephants? Used against Pyrrhus of Epeiros in 279 BC, apparently without much effect? I'm not a historian, just a gamer. So said, I found a few information written in Italian about "Plaustrella". has analyzed a note written by Guido da Vigevano (ca. 1280-1350) entitled Texaurus regis Francie. According to this text a hundred Plaustrella were built by Mastro Guintelmo in 1160 as a defensive machine. They were not only man-pushed, but also oxen driven. They were utilized by Bologna in 1229 in the battle of San Cesario sul Panaro against Parma to stop the enemy army. Then, as I see the Plaustrellum as a defensive machine, may be it should be difficult for it to charge the enemy (not permitted ? or expensive in terms of Command Point ?). Fab wrote: I'm not a historian, just a gamer. Thanks, Fab. I'll read that article. (Or get Google Translate to help me read it, and ask you if I have questions about any particular passage?). If it is also used by Bologna in 1229, then letting any Later Communal army in the whole 1150-1320 period use them is probably okay. Do you have any info on the battle of San Cesario Sul Panaro between Bologna and Parma? I couldn't find anything on the web, and I don't have a lot of sources for Communal Italian battles. shattered by artillery: we could go either way on this. As a smaller item than war wagons, and with more of them, they would be a less easy target for abuse, but I see your point. Any decision we make is going to be guesswork (i.e., without practical data) since we have no data on how 1169 or 1229 AD artillery interacted with the plaustrella in those battles, and there were no artillery in any Classical Indian battle v. Rathamasaula or used by Pyrrhus against Roman desperation weapons either. deployment -- although I agree with your point, we probably won't want to legislate forcing good deployment. If you want to deploy your bitchin' slow expensive troops in the back, that's likely to be a mistake in the game -- and allowing players to try stupid stuff that simulates stupid stuff that Medieval generals might try is a reasonable approach. With that said, we should probably make any plaustrella become Battleline even if their original troops were not Battleline. cost: yes, that was my assessment, although as yet untested. difficult for them to charge: the 2mu movement rate might be enough here. If we were to make it +1 command point to move then the cost should be reduced to probably +1 per stand, as that's a pretty ugly burden. Preventing them from engaging the enemy (same limit as wwg) is even worse, as (unlike wwg) they have no missile fire, so no way to attack at all. An enemy could put a couple of horde or rabble in front of them and bang they are useless for the whole battle! We could go that way, but if we did we might reduce the cost completely (no cost increase at all). simplicity: even where we change the rules to introduce a new battle card, we'd always like to keep it simple. I'm talking to myself here as much as to you -- the constant war is between "making new rules that reflect something historical" and "try to avoid adding more rules unless they really add something to the game". History v. Simplicity is the toughest dilemma in Triumph! design. I thought of another case where man-pushed barriers appear -- the Ghurid army. Right now we represent Ghurid infantry as Lt.Spear if they fight without their comfy padded barriers on wheels (Karwah), or as Pike if they fight with their Karwah. Perhaps instead we ought to represent them as Lt.Spear without (unchanged) and as Heavy Foot with Plaustrella if they take Karwah. The Heavy Foot transformation would be necessary regardless because Lt.Spear don't suffer in difficult terrain and anyone pushing a bunch of Karwah should be close order and suffer significantly in difficult terrain. Thanks, Fab. I'll read that article. (Or get Google Translate to help me read it, and ask you if I have questions about any particular passage?). I'm ready to help (hopefully better translator than Google). David Kuijt wrote: If it is also used by Bologna in 1229, then letting any Later Communal army in the whole 1150-1320 period use them is probably okay. Searching the web. At the moment nothing detailed about the battle itself. It was during the war (one of the many many Italian Communal wars) between Bologna and Modena. Bologna was besieging the castle of San Cesario when Parma (allied to Modena) sent troops to disturb the "Bolognesi". At this point, accordind to Bologna's historical sources, Parma's troops refused the battle while the "Bolognesi" were ready and willing to fight. On the contrary, according to A. Settia, Bologna stopped the enemy by using Plaustrella so that they, in the meantime, could successfully take the castle. After having finished the main job, the "Bolognesi" attacked the "Parmensi" with "real" WarWagons (offensive artillery on carts) and inflicted heavy losses to the enemy (they went close to destroy the Parmisan Carroccio). I have nothing to add. I perfectly understand your points. I promise I won't criticise your choices !! Fab wrote: Searching the web. At the moment nothing detailed about the battle itself. It was during the war (one of the many many Italian Communal wars) between Bologna and Modena. Thanks, Fab. I couldn't find a thing. 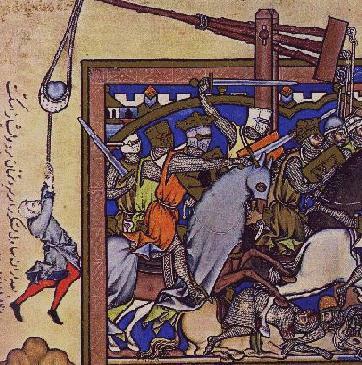 One problem with the above -- offensive artillery on carts in 1229? That's way too early. Gunpowder doesn't appear in Europe until about a century later, and the early 14th century weapons were pretty sucky (arrow shaped missiles fired from guns shaped like flower vases! ), and later 14th and early 15th century weapons were very heavy (not capable of being cart mounted). Ballistae are possible -- IIRC, Ballistae appear in a late 14th century ambush in the Veneto somewhere, used to attack a Condotta army while it was arrayed along a road with swampy grounds on all sides. If that's so, then they certainly could have been used in 1229, but I'd far rather understand what the Bolognesi were actually using according to the sources (and when the source was written -- sometimes battle accounts are written way after the battle, and so anachronisms can appear). Also I'd like to know because right now there are no artillery (whether gunpowder or ballistae) allowed the Communal Italians -- if the Bolognesi used it decisively in 1229, then an Artillery option maybe should be added. One of the issues we'd like to resolve with the Battle Cards is how to handle the Carroccio that were used by many Communal Italian armies, plus also by Hungary in at least one battle in the same period, and by some German (HRE) armies in that period, and in the Battle of the Standard (Northallerton) in England. I've got a good idea, but we haven't had time to meet together and hash it out yet. David Kuijt wrote: One problem with the above -- offensive artillery on carts in 1229? That's way too early. Gunpowder doesn't appear in Europe until about a century later, and the early 14th century weapons were pretty sucky (arrow shaped missiles fired from guns shaped like flower vases! ), and later 14th and early 15th century weapons were very heavy (not capable of being cart mounted). Ballistae are possible -- IIRC, Ballistae appear in a late 14th century ambush in the Veneto somewhere, used to attack a Condotta army while it was arrayed along a road with swampy grounds on all sides. Found the battle -- Maclodio 1427 (from Osprey 136: Italian Medieval Armies 1300-1500). Described as "large siege crossbows mounted in threes on frames and set to shoot in a limited arc" -- so not ballistae per se, but functionally equivalent. I wrote "Artillery" because A. Settia used the corresponding Italian word. Nothing to do with gunpowder, sorry. The description by the original author, Guido da Vigevano, was about machines ("manganelle" : trebuchet ?) able to throw stones and other projectiles, and able to move surrounded and protected by plaustrella (or better, "panthera"). And there are other sources about throwing machines on cart. Mastro Bulavello, a few year before San Cesario battle, built for Imola (another city around Bologna) some throwing machines "de carro" (latin for "on cart", movable). A contemporary writer described this movable "bolognese" artillery as "a new kind of plague never heard before". Salinbene da Parma defined this as an "unusual way of fighting". A Venetian document says that in the castle of Treviso in 1345 there were two "manganelle" «que fereantur super quodam caro per castrum ubi oportebit» (freely translating from latin : which could be moved where necessary in the castle on cart). This is all the help I can give. Fab wrote: I wrote "Artillery" because A. Settia used the corresponding Italian word. Nothing to do with gunpowder, sorry. Good, I suspected as much -- translations cause a lot of misunderstandings. I remember one gamer-historian who wanted the Carthaginians to get some Pikes in their army, some time in 2005 or so, based upon the fact that the word "Pike" was used in an English translation of a Roman (Latin) author (Polybius? I forget whom). The English translation he was using was from someone who was not a gamer, and used "pike" to refer to a lance (spear) used by foot, rather than a lance (spear) used by mounted. Gamers get very focused on the technical terms, but you get no guarantee that the technical term in English has the same precision (and is used for exactly the same purpose) as the technical term used in a dead language 2000+ years ago. Fab wrote: The description by the original author, Guido da Vigevano, was about machines ("manganelle" : trebuchet ?) able to throw stones and other projectiles, and able to move surrounded and protected by plaustrella (or better, "panthera"). That's all good information. Do you have a date for the Imola event associated with Mastro Bulavello? When contemporaries describe something as "a new kind of ..." or as "unusual" we can often use that to estimate the start year for a line of the army listing. The Maciejowski bible is French around 1250. So either way, it sounds like we should have an option of a stand of artillery (manganelle) for the Communal Italians. Fab wrote: This is all the help I can give. It's a great help, thanks! About mastro Buvalello (this is the right spelling, I mistakenly wrote "Bulavello") : he was hired by Imola municipality in 1222 (see Aldo Settia, Il riflesso ossidionale) to design and built throwing machines.